Thinking about condo living…trying to decide if it’s the right lifestyle for you? Well not that long ago in Regina your choice would have been simply apartment condo or townhouse and now the options are almost limitless! There are Apartment condos with surface stalls or underground heated parking, urban or suburban, entry level & budget friendly or upscale finishing with amenities including optional guest suites, workout centres and car wash facilities, high rise with rooftop areas , 3-4 floors with balconies, or the newest option of condos & mixed use of business and commercial on the lower levels. 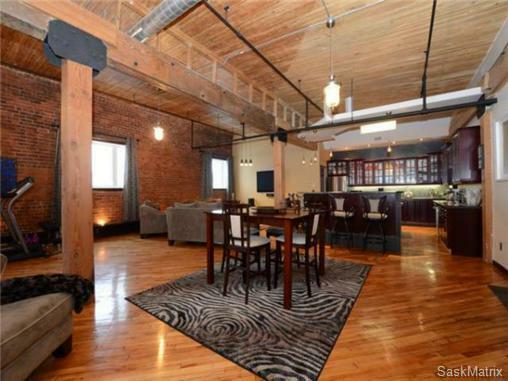 Or how about a loft condo in Regina’s trendy Warehouse District where every unit is unique in its style, as above, and every complex has its own individual features. Or maybe a Townhouse with one or two electrified stalls or a detached garage stall, single or double attached garage, basement or not? Ok so now that you are completely overwhelmed with the degree of choices available, let’s simplify the process! Budget - don’t forget to include condo fees in your monthly budget! Once we know those 3 things we can put together a list of all of options currently available and start to narrow down the choices. It can be difficult enough for buyers to sort through all of the listed units let alone all of the new construction projects in various stages of the build but we stay on top off the new developments so it’s our job to provide you with the details of all of the options, resale or new, that fit your three criteria. That being said, sometimes budget changes when you’re not finding things you like in the set price range and also sometimes some of non-negotiable needs suddenly become negotiable when staying within budget in the most important priority! If you are thinking about a condo or a new home and need help navigating the process and all of the options available, give us a call! We are the team in Regina that can help you make the right move.